Black cherry (Prunus serotina) is common to Kentucky and an important timber and wildlife species. However, black cherry can be dangerous to livestock. When black cherry leaves wilt, they produce cyanide compounds that lead to poisoning. Because of this, farms need to manage black cherry to minimize its accessibility to livestock. Fencerow maintenance should include scouting for both established black cherry trees and tree seedlings developed from seed carried by birds to the fencerow. If removal of standing trees is being considered it involves more than simply cutting them down. Black cherry trees are capable of sprouting vigorously from cut stumps, a common characteristic of most hardwood trees. These sprouts originate from buds around the groundline of the stump. Sprouts, called root suckers, occasionally occur directly from the lateral roots of cut trees. However, the black cherry root suckers much less than other common fencerow species (e.g. black locust). Stump sprouts have the potential to develop rapidly in height, fed by the large existing root system. 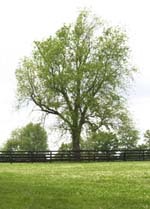 Often sprouting results in multiple stemmed trees with more cherry leaves (and a greater problem for livestock) than the original tree. Removal should ensure that the sprouting is reduced or eliminated. If trees are to be cut, treatments should be considered that will reduce or eliminate sprouting. Normally grinding the stump, using a commercial stump grinder, will eliminate its ability to sprout from the stump. Since black cherry rarely forms root suckers, stump grinding can be an effective means of reducing or eliminating sprouting. If stumping grinding is not undertaken the use of a cut stump herbicide treatment along with cutting is recommended. There are a number of herbicides labeled for controlling black cherry in pastures and fencerows. These herbicides are systemic, meaning they will travel throughout the treated plant and have the potential to kill a portion of the root system so that spouting is reduced or eliminated. Proper application technique is important. If herbicides are not used, sprouting can be expected, and frequent cutting will be required until the food supply in the roots is exhausted. This may require several years of treatment. When trees are to be cut down, a cut stump herbicide treatment is recommended. This method involves spraying the freshly cut surface or stump with concentrated herbicide solution. It is important to treat the cut stump as soon as possible and no longer than one hour after the top of the stump is exposed to the air. As the top of the stump dries out and living cells in the outer portion of the stump die, the effectiveness of the treatment is reduced. If trees have already been cut, it might be possible to re-cut the stump within several weeks after the initial cut. Re-cut at least 2 inches below the original cut to expose moist live wood and apply the herbicide. However, delaying the treatment reduces the effectiveness. Some commonly available herbicides in Kentucky that are labeled for cut stump application include products that contain: glyphosate (e.g., Roundup Ultra and Roundup Pro); triclopyr (e.g., Remedy and Garlon); dicamba (e.g., Banvel and Clarity). Other herbicides such as Crossbow, Tordon, and Pathway are also labeled for cut stump applications; however, these products have a greater potential to produce damage to adjacent crop and ornamental plants through volatilization and/or soil persistence of their active ingredients. Therefore, they are not recommended for use in areas directly adjacent to desirable plant species. In addition, Tordon and Pathway are noncropland herbicides that are not labeled for use in pastures or in fencerows adjacent to pastures. Follow label directions for cut stump or stump surface applications. Cooperative Extension publication AGR-172, Weed Management in Grass Pastures, Hayfields, and Fencerows, discusses some of these materials in more detail and provides a chart comparing their recommended uses. Commonly, black cherry is listed as a hard to control species, and it is important to apply the herbicides correctly. Stumps to be treated should be freshly cut as indicated above. The surface of the stump should be thoroughly wetted, especially the inner bark, cambium (the growing point between the bark and wood), and outer 2 to 3 inches of wood (sapwood). On large stumps the inner wood or heartwood need not be treated. All herbicides labeled for stump application specify that some type of concentrated solution be used. Note that this is significantly different from the dilute solutions that are commonly used for foliar applications. Do not use "ready to use" or dilute solutions of Roundup or other herbicides that are commonly available for foliar applications. Check the label for the best time of year for application. The one time of the year when cut stump application is not recommended is late winter when the sap is "rising" in the trees. During this time of the year, the stump may exude sap from the stump, flushing the herbicide from the cut surface. This normally occurs in late February and March. Cut stump application generally carries less environmental risk than foliar application because the herbicide is applied directly to the target plant with less risk of overspray and nontarget plant exposure. However, it is possible that the herbicide may be transported through black cherry roots to a nontarget black cherry or ornamental cherry tree that is growing nearby or adjacent to the treated stump. In these cases physical removal without the use of herbicides may be warranted. For small trees, where a cut stump application may be difficult, a foliar treatment can be used if the trees are small enough that all or a large majority of the leaves can be sprayed. This technique involves the spraying of a dilute concentration of herbicide (mixed according to label directions) to cover the foliage. Foliar applications work best after full leaf out (early June) until one or two weeks prior to leaf fall. Leave the treated trees in place until all the foliage has browned, ensuring that the herbicide has entered the root system. Livestock should not be allowed access to areas where trees have been sprayed until the treated trees have been removed or wilting foliage is no longer present. When using foliar sprays be aware of nearby sensitive crops such as tobacco that may be highly susceptible to herbicide drift. Other plants in the landscape such as desirable ornamentals can also be injured if they come in contact with a herbicide used for control of woody vegetation. Check the label for further restriction on entry into treated areas and other precautions. Mention or display of a trademark, proprietary product, or firm in text or figures does not constitute an endorsement and does not imply approval to the exclusion of other suitable products or firms.